Ralph came by this evening to help me figure out some stuff with my irrigation and he had some great tips. I'm writing this as some notes to myself, but I need to increase my fertilization next year. Target would be between 1.8 and 2.0 on the EC tool. Ralph always has some great ideas to share. Some proven and some that he is still kicking around. My bet is that Ralph grows a big one next year. He has spent the better part of this year researching and meeting with growers at their patches to learn from some of the best. He and his good wife had quite the tour this season. It isn't something that the average gardener would think about, but your irrigation in some ways may be limiting the growth of your plants if the water is too cold. Biology in the soil tends to be more active when the soil is warm. If you are watering with 50 degree water then you may be cooling the soil and slowing the biology that feeds the soil. It is one reason I use soil heating cables. In the Spring, when my plants are smaller I typically warm my water before watering. As the plants get bigger that becomes more of a challenge. I know growers that have large, black painted water tanks that are used to warm the irrigation water. I don't have that, so I installed a portable hot water heater that I'll still working with to get working properly. I just checked the temperature of the irrigation water. Right now it is 60 degrees. I would guess it was probably 5-10 degrees warmer a month ago. For early morning watering, that is warmer than my typical outdoor temperatures, but not ideal. I'm hoping to water early in the morning with 75-80 degree water. Not sure I'll be able to get enough volume out of my hot water heater to get it that warm. Pleasantly surprised to see my how to grow a giant pumpkin video has already hit 8,278 views since March. If you watch the video and grew a pumpkin this year I would love to hear how things turned out for you. If you would like to watch the video, it is free. 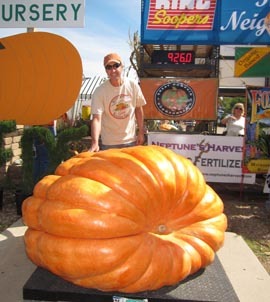 If you need growing supplies, top fertilizers or seeds visit seeds.giantpumpkinman.com. Looking for some fun fall events for your family? 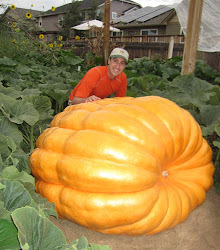 The Utah Giant Pumpkin Growers have two fantastic events for you. This Saturday attend the first giant pumpkin weigh-off of the season at Thanksgiving point. Start time is 11:00am. See the largest pumpkins in Utah. Two weeks later, on October 13th, go to Hee Haw Farms. I'll have my pumpkin at this weigh-off. Stuff for all the kids at both events. More at www.utahpumpkingrowers.com/events.html. The 2145 pumpkin has continued to slow down. The morning lows have consistently been in the 40s the last two weeks. Day time highs have been nice in the mid-80s, but with those low temperatures it takes a long time for the patch to get warm enough that the pumpkin grows. There probably isn't more than 12 hours of growing a day right now. It would be interesting to see what the daily gains would be if the plant were kept above 70 degrees each night. I'd bet pumpkin growth would double. Sprayed on the leaves some some TKO today to give the plant a little boost and to help fight the powdery mildew that has started to come on lately.